Alvaro Morata returned to the Santiago Bernabeu to haunt Real Madrid as his second half strike dumped Ancelotti's men out of the Champinos League and sent Juventus to the final in Berlin. The highly anticipated second leg clash began and a raucous cauldron that is the Santiago Bernabeu roared as the teams made their way out for kick-off. The first real chance occurred when Juventus lazily allowed Marcelo to gain a foothold on the left side, scamper forward and whip in a high cross over to Bale. The Welshman rose above his marker and planted a header away, but it just bundled over the crossbar. Madrid would then go even closer to levelling the aggregate score, as Benzema met Carvajal's cross, turned past his marker at close range and battered a shot away. On his left side, it blootered well over Buffon's bar as a raucous roar of "Ooh!" bellowed around the stadium. Lively start. The away side were happy to sit back in the early stages, frustrate Madrid and deploy their preferred match tempo. 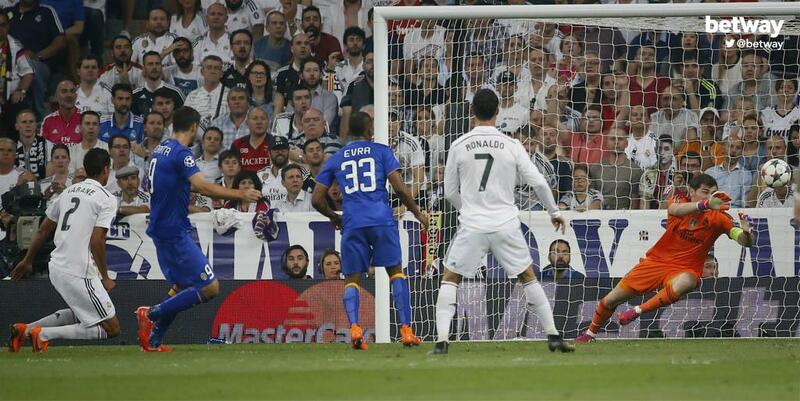 Moments later, Ronaldo's free-kick ricocheted off Vidal in the wall and landed on top of the net. The Ballon d'Or winner's drought continued but compared to some of his other free-kick attempts, that was much more encouraging. Casillas' first real effort in goal occurred when the Spanish veteran plunged down low to poke Vidal's solid left-footed shot away. Juventus were well in this game and gave their fair share of attacking football. Shortly after, he turned Lichsteiner's effort around the post for a corner. Nothing would trouble Madrid from the set-piece but the away side looked quite dangerous moving forward. Marcelo spotted a gap to feed Benzema through, and he did. Slotting a pass down the left, the Frenchman latched onto it and scampered goal-wards. Benzema saw Ronaldo in the middle, attempted a cut-back but Pogba vitally intercepted to thwart the Portuguese man of gaining possession. As twenty minutes passed, Madrid became increasingly dangerous and Chiellini couldn't resist lunging in for a tasty challenge. Inside the box, he clumsily bundled Ronaldo over and to his protest, gave away a penalty. Up stepped Ronaldo himself, and he banged a sweet strike into the middle; sending Buffon the wrong way. With the tie then level, the advantage was seemingly in Los Blancos' court. Morata scorched forward with quick feet and dazzling footwork; briefly piquing the concentration of Madrid's back line. Cutting to his right side, the striker dangerously cut back across goal but a solid interception would cut out any danger. Moments later after Juventus' initial attack was cleared, Los Blancos countered with Benzema on the ball, Isco to his right and Ronaldo quickly arriving on the left. The Frenchman held up play, fed his Portuguese team-mate who cut to the left byline, stopped, curled a short cross over but Isco but a crucial block halted the selfless play by Ronaldo. Madrid would then mistakenly throw too many bodies forward and Juventus had a great chance of alarming them big time. Tevez dispossessed Kroos, and with several blue shirts assisting him, Los Blancos found themselves in danger. The Argentine fed Morata, who cut in to Vidal on the left side of the box but his cross was deflected out of play. Afterwards, another good counter attack from Madrid occured with a long-ball reaching Ronaldo on a blistering run. He entered enemy territory but his left-footed shot pummelled against the side netting and out. The hosts headed into the interval with the game unofficially banked. Due to the away goal rule, as it stood, Juventus were going home as semi-finalists only since Madrid grabbed an away goal in the first leg. Allegri's men had serious work to do in the second period. 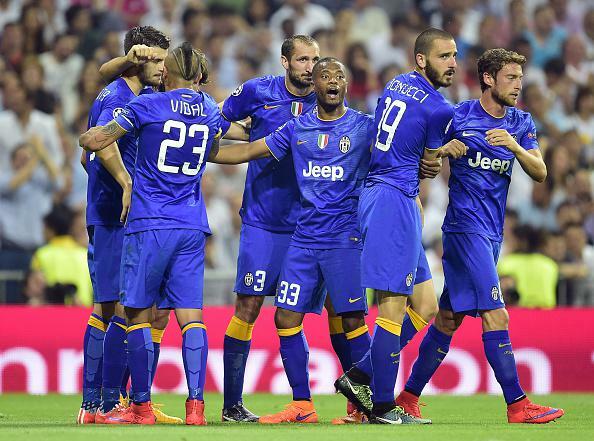 After a short delay, Juventus kicked off the second half in search of a vital away goal. As it stood, they were heading out of the Champions League. 1-0 up at half time, inside the Bernabeu: Advantage Real Madrid, and they were set up to be a tough nut to crack. Juventus, though, weren't rushing any of their play and looked calm and composed on possession. Marchisio would then awaken Casillas by blasting a right-footer just past the post. The Spanish goalkeeper was always in charge, but we all know the Juventus man is more than capable from that range. Of course, there was always a big risk hovering around Juventus, that being a blistering Madrid counter when the visitors had men forward. Carlo Ancelotti may have touched upon that possibility during the interval. Juventus cuaghth Madrid off guard, as Vidal Carvajal on the edge of the box and slipped a dangerous pass through to Morata but the Spaniard was unfortunately offside. He was clear on goal, but Casillas would clear the ball anyway. The away side were looking dangerous, and they would take advantage of some poor Madrid defending. Casillas punched a cross away, but only to a blue shirt outside the box, picking out Pogba on the left byline. The Frenchman headed down and picked out Morata, who chested the ball down and battered a bouncing strike straight past Casillas into the net. Massive, massive goal despite the Spaniard's reluctance to celebrate. As it stood, Juventus were heading to Berlin. Madrid knew the Rodriguez was given possession outside the area, cheekily back-heeled to the over-lapping Marcelo who cut-back to Bale in the middle but the Welshman's effort agonizingly dashed wide of the post. Rodriguez unleashed a thunderous effort from outside the box, but unfortunately blootered over the crossbar. A sense of frustration began to creep into Madrid's play, with them still requiring a goal to take the visitors to extra time. Juventus would then all of a sudden pop up Madrid's half Marchisio met a lovely pass, turned onto his right foot inside the area and attempted to slot past Casillas, only to be denied by the Spanish veteran's superb diving skills. Surely the save of the match. Ronaldo latched onto Marcelo's threaded pass to on the left byline, and looped a fantastic cross over to Bale at the back post who rose well to head but just couldn't keep his effort down and it bundled over the crossbar. Allegri replaced Italian veteran Pirlo with Barzagli in a smart defensive move as Juventus were just a matter of minutes away from stunning Madrid to earn a place in the awe-inspiring Champions League final. The away side would then go tantalizingly close to wrapping up the game in style as Pogba, on the edge of the box, fired a shot at goal but Casillas did well to pummel his effort away. Ancelotti's men desperately tried to level the aggregate score in the death, but Juventus' solid defensive work would keep them out of doing that as the final whistle blew to confirm the visitors' place in the final against Barcelona. Pure despair for Real Madrid, who have been unable to defend their title. 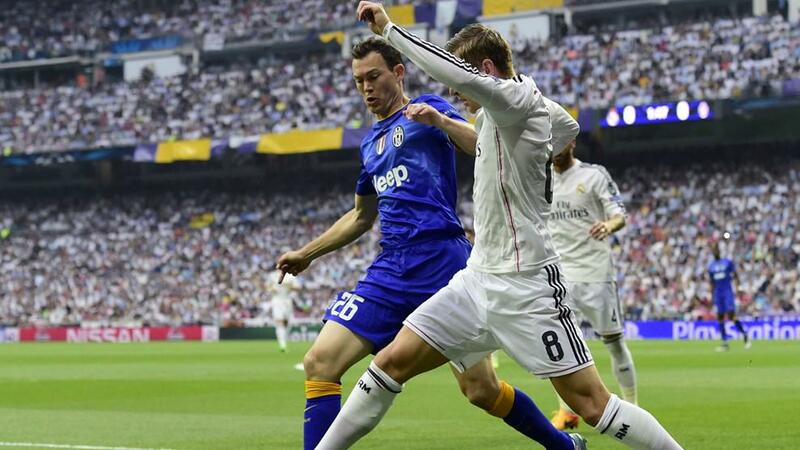 Match report: Real Madrid vs. Juventus, UEFA Champions League, semi-final, second leg.